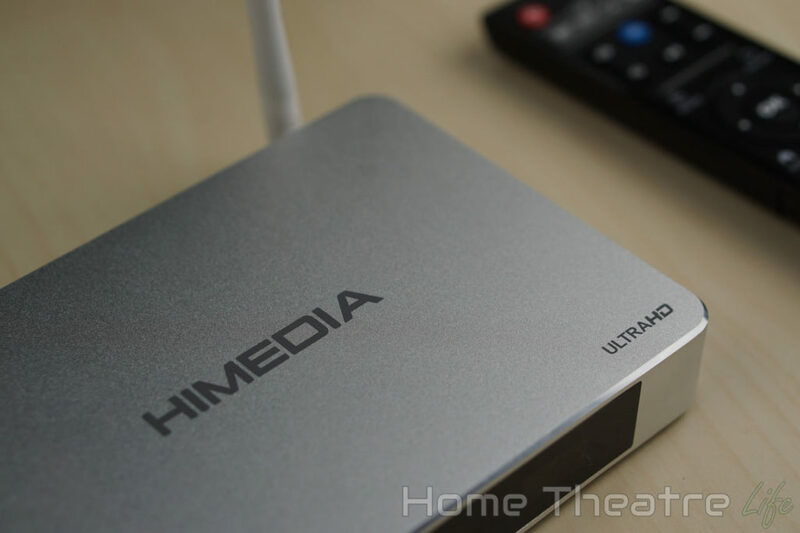 Home Reviews Android TV Box Reviews HiMedia Q5 Pro Review: HiMedia Strikes Again! 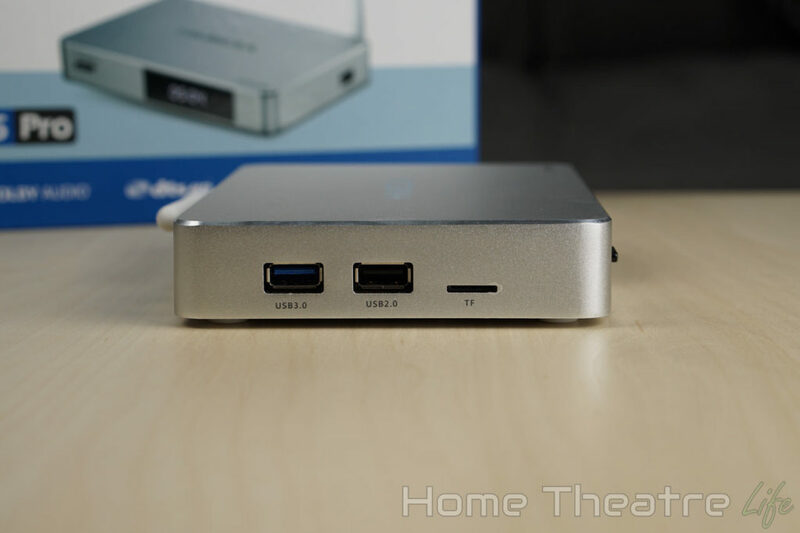 The HiMedia Q5 Pro is the company’s latest Android TV box. 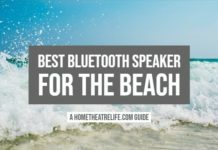 Following in the footsteps of the excellent HiMedia Q10 Pro, the HiMedia is effectively a budget version, losing the 3.5″ Harddrives Bay and halting the amount of onboard storage in exchange for a smaller footprint and price. Thanks to HiMedia for providing me a sample to review. 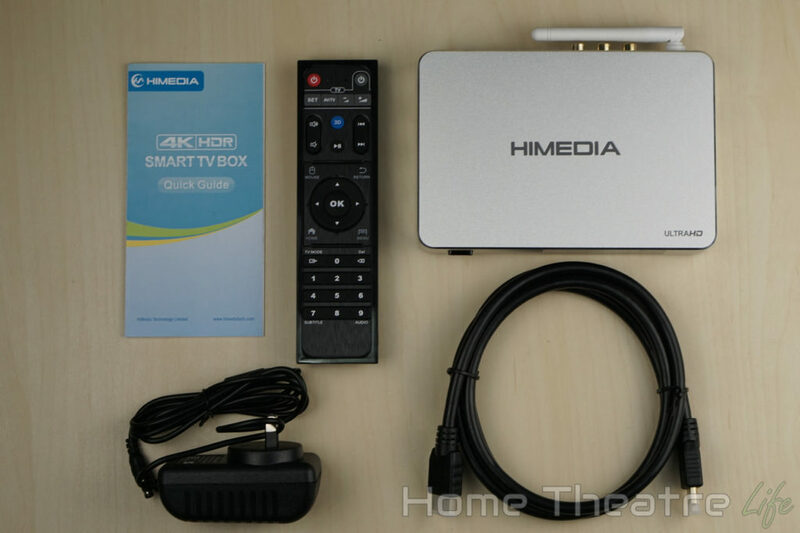 The HiMedia Q5 Pro is available from Amazon, Aliexpress, W2Comp and eBay. 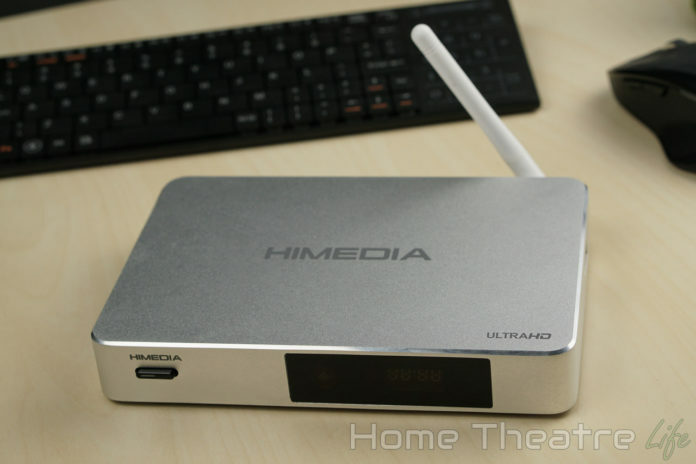 The HiMedia Q5 Pro borrows its style from HiMedia’s last compact Android TV box, the HiMedia Q8. The unit is a sleek aluminium block, with its front panel broken by a large LED display. The case shows the same attention to detail as other HiMedia devices, with chamfered edges and a matte finish that hides fingerprints nicely. There are ports located all over the unit. 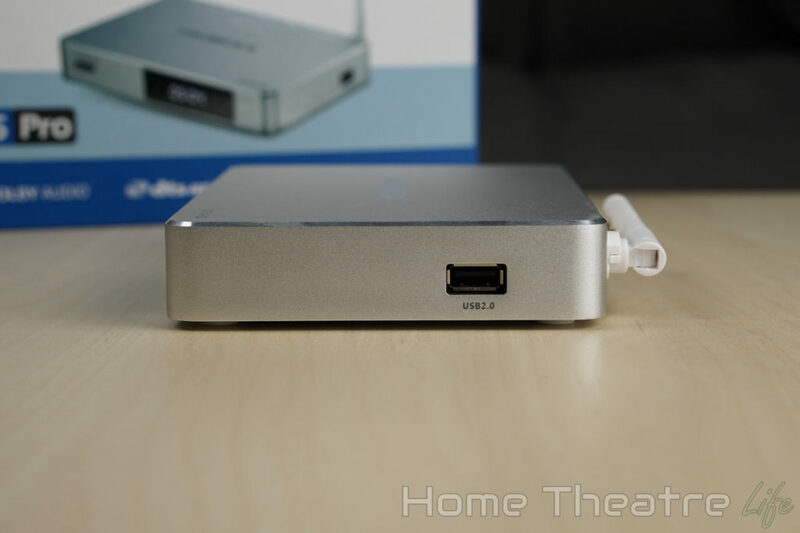 The right side houses a single USB 2.0 port. 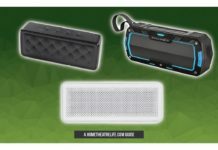 The left side features 2 USB 2.0 ports and a micro SD card slot. As you’ve probably guessed by now, most of the ports are on the rear. 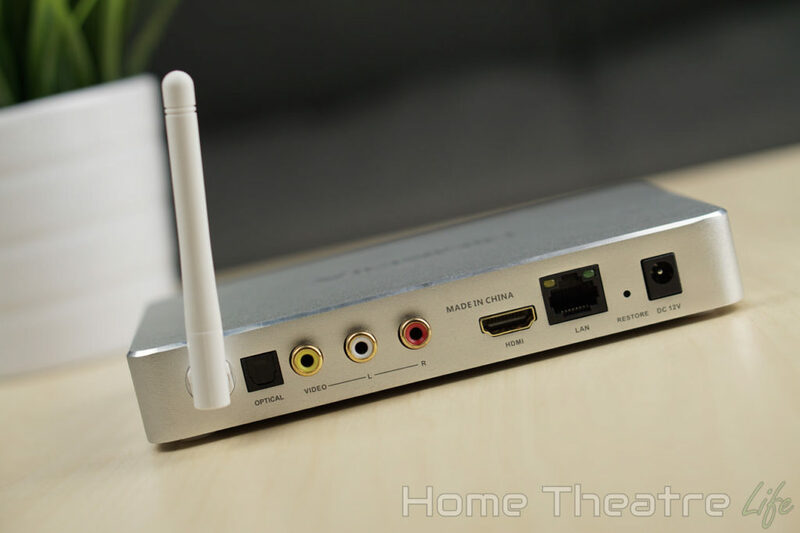 Here, you’ve got optical audio output, composite video output, HDMI out, Ethernet, a reset button and DC in. 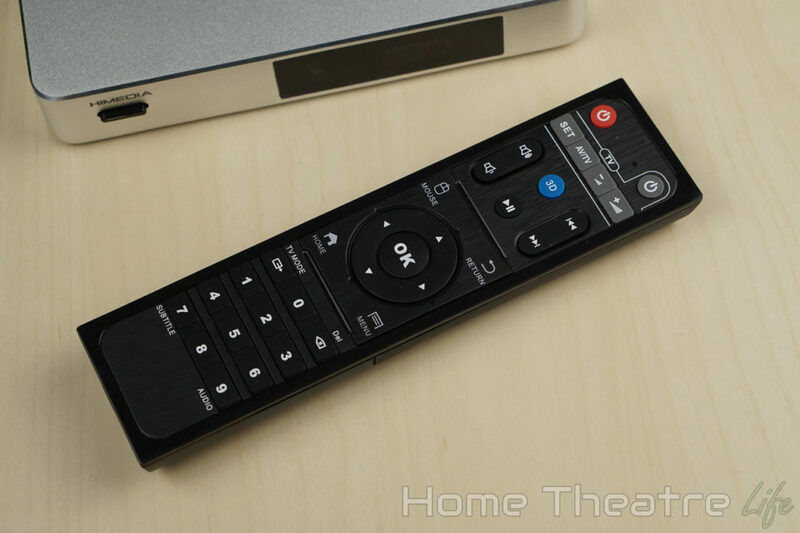 The included remote is the same one included with the HiMedia Q10 Pro. 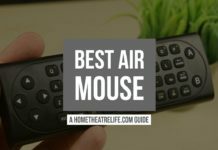 It’s got plenty of functionality, including a solid set of multimedia controls, Android buttons and a mouse mode. 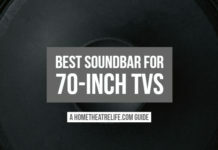 It can also learn IR commands, allowing you to map your TV/Amp’s volume and power buttons to the HiMedia Q5 Pro’s remote. The remote’s buttons are nice and quiet too, rather than the “clicky” feel like some of the cheap included remotes. Booting up the unit takes around 25 seconds with a keyboard and mouse connected. Standby isn’t supported so you’ll have to leave it idle or power it up every time which is frustrating. It can be powered up via the remote however. 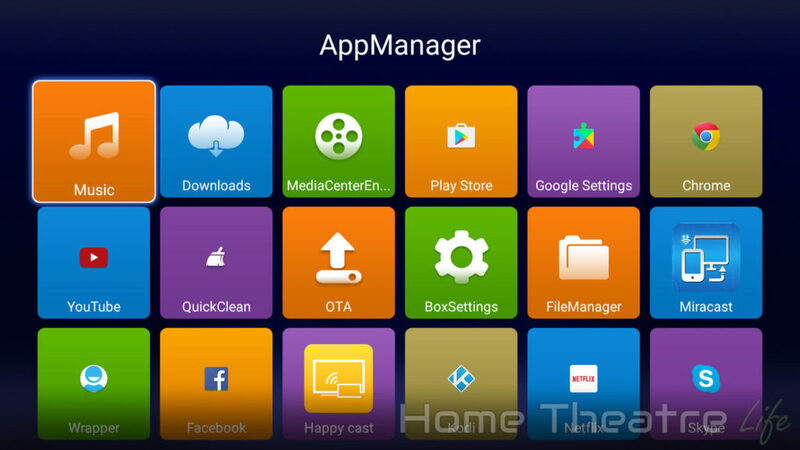 HiMedia have kept the same launcher as the Q10 Pro, complete with its bright colors and flat tiles. It’s definitely one of the most attractive launchers available. The company has included a few apps out of the box. Facebook, Skype, Netflix, a TV-friendly version of YouTube, Kodi 16.1 and Happy Cast for AirPlay support are pre-installed. Google Play works as expected too. HiMedia have opted to not root the Q5 Pro out of the box so you’ll need to root it yourself if you need it. 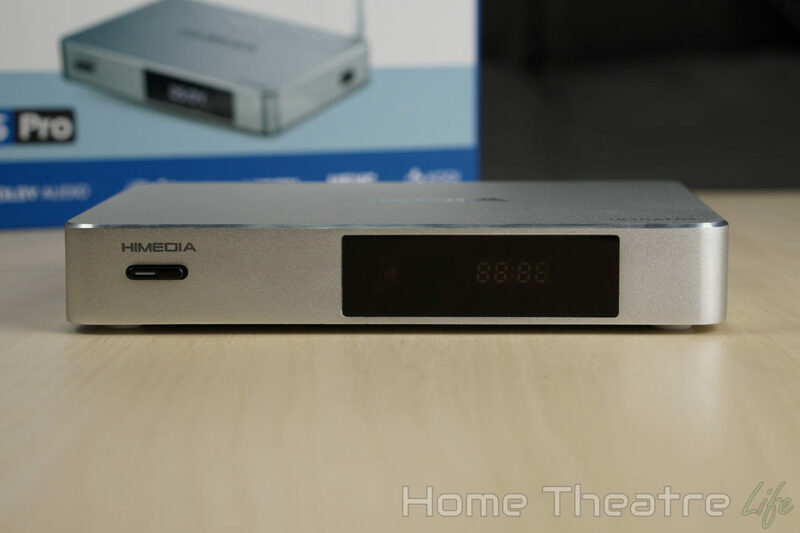 HiMedia have also kept their SAMBA server on the Q5 Pro. However, without the SATA port included with the Q10 Pro, you’ll need to rely on USB harddrives to add storage. 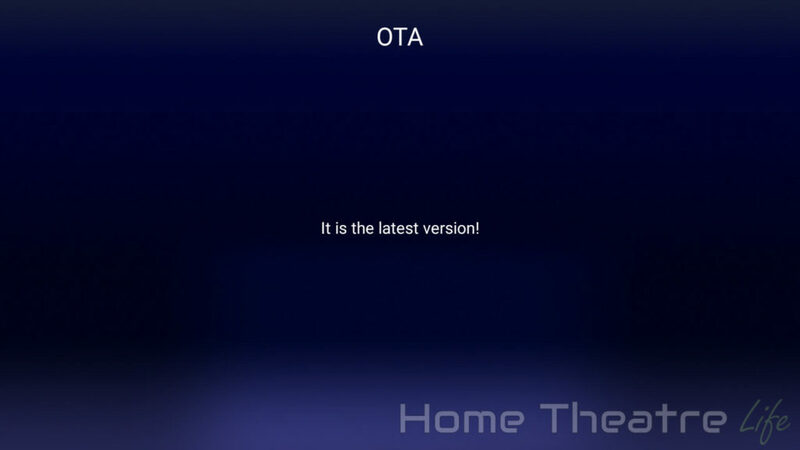 OTA updates are supported. However, there wasn’t any firmware updates available at the time of writing. 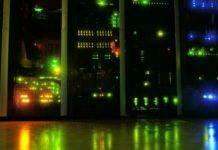 The company does regularly release new firmware updates to fix issues and add new features however. The HiMedia Q5 Pro’s performance was excellent when using Android 5.1.1. Whether navigating the OS, browsing Kodi or launching apps, everything felt smooth. The firmware seems to be stable, with only 3DMark crashing on me (though this has been an issue on a few boxes recently so I’m starting to suspect it’s an issue with the app). It was great to see HiMedia have included the latest version of Kodi pre-installed (16.1 at the time of writing). 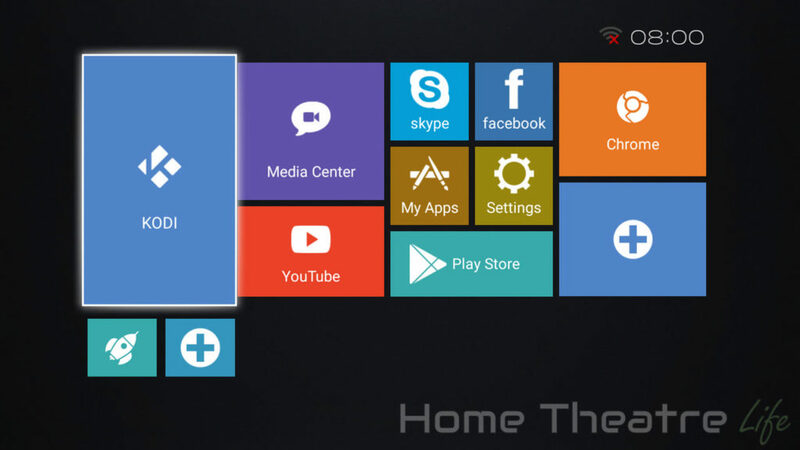 The company has also included the HiMedia Wrapper this time, modifying Kodi to use the HiMedia Player and enabling automatic framerate switching. Deinterlacing performance was good, as long as you turn off the Imprex engine. With Imprex switched on, my interlacing test video showed clear combing. However, watching standard interlaced footage appeared artifact free so your mileage may vary. Automatic framerate switching is supported but only if you use HiMedia’s internal player. 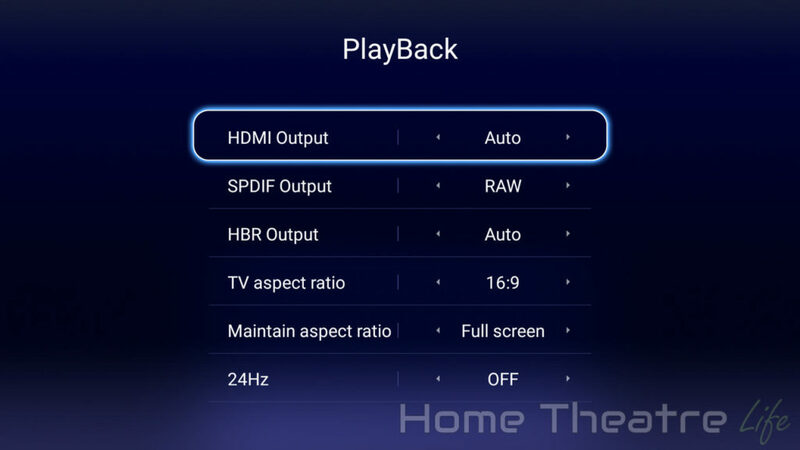 However, the HiMedia Wrapper APK will do the config for you and you just enable it under HiMedia’s playback settings. I have to mention that Hisilicon’s Imprex 2.0 processing engine is quite nice, offering realtime image enhancements. I found that it generally improved images, adding some extra sharpness and depth to the image, particularly in darker scenes. Airplay via Happy Cast app worked well for both audio and video. AirPlay Mirroring worked on my iPhone 6 running iOS9 for videos and games, though streaming apps such as Netflix would cause the AirPlay stream to stop so I suspect it has something to do with DRM. Gaming on the HiMedia Q5 Pro was great, matching the performance seen on the HiMedia Q10 Pro. 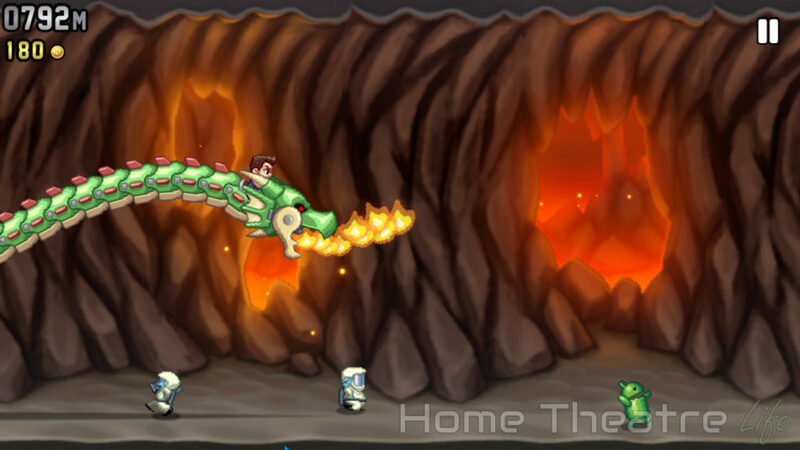 The 2D title, Jetpack Joyride, played perfectly, without any lag. Beach Buggy Racing played decently at maximum settings, achieving around 25-30fps depending on the action on the screen. Lowing the graphical settings improved performance however. 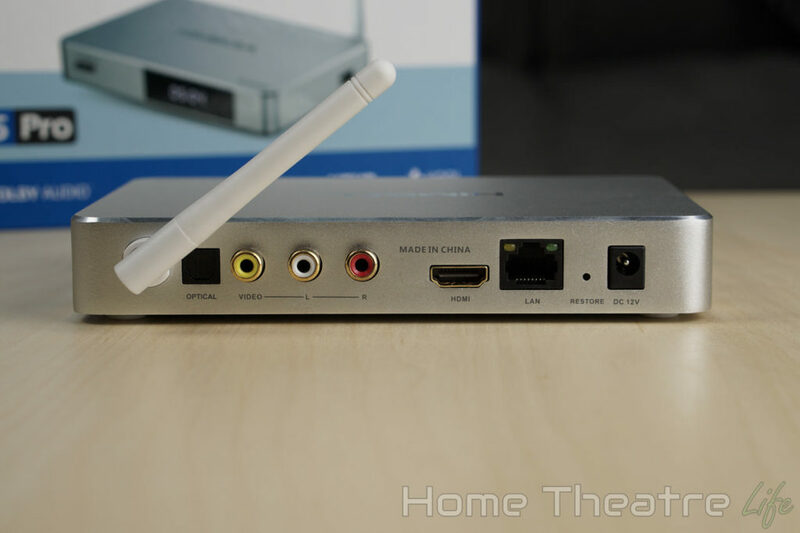 That said, if you’re wanting an Android box for gaming, the HiMedia Q5 Pro is probably not the ideal Android TV box for you. 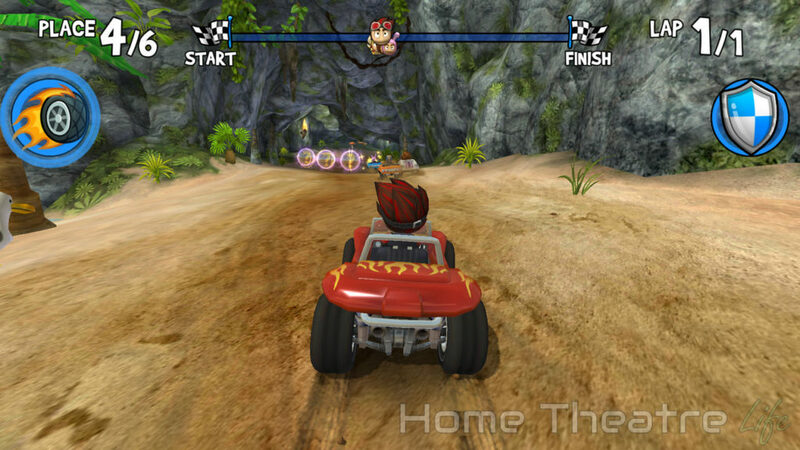 My GameSir G4S (read my review) worked perfectly via Bluetooth and I was able to use it play Beach Buggy Racing. 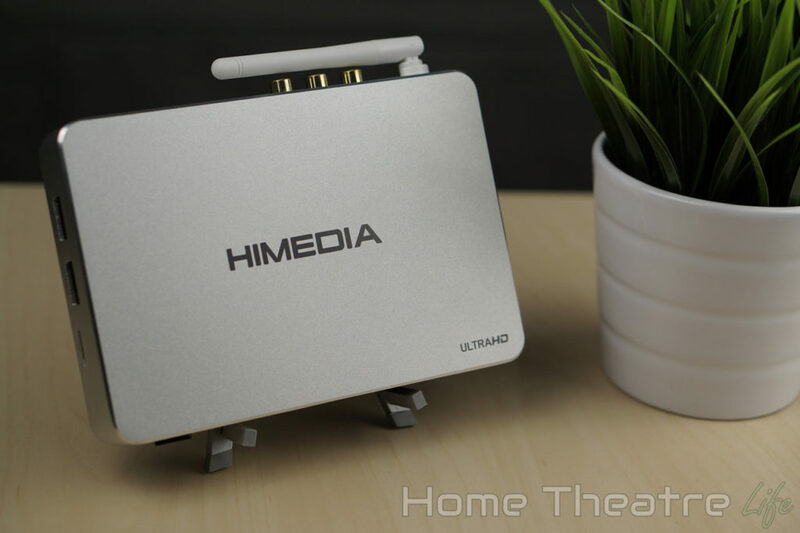 Wireless performance was fantastic on the HiMedia Q5 Pro, with upload and download speeds of 46.6Mbps and 44.6Mbps respectively on the 2.4GHz band and 102.7Mbps and 121.7Mbps on the 5Ghz band. Ethernet performance was decent, with upload and download speeds of 597.9Mbps and 606.1Mbps respectively. I wasn’t able to complete the 3DMark benchmarks as the app kept crashing whenever I tried to swipe to the other benchmarks. This appears to be an issue with the 3DMark app rather than the Q5 Pro. 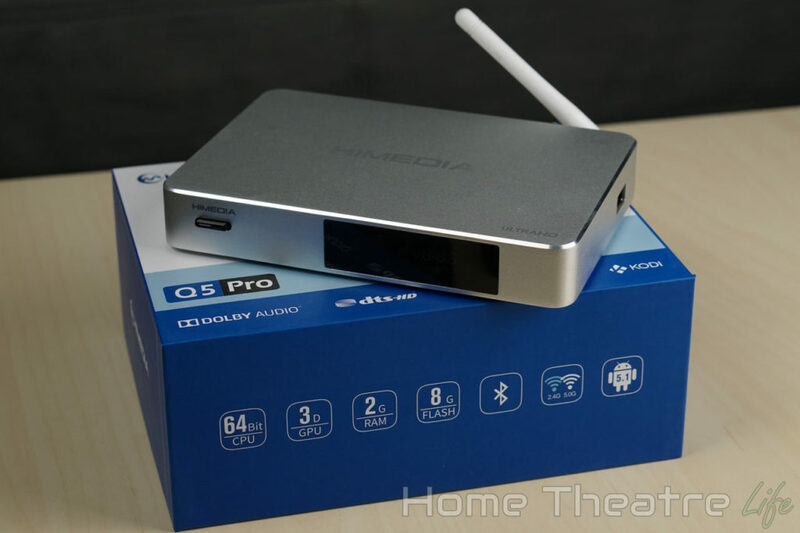 The HiMedia Q5 Pro is another excellent Android TV box from the company. It takes the excellent hardware of the HiMedia Q10 Pro and shapes it into a far more compact package, keeping all the goodness intact. Whilst it’s not a gaming powerhouse, those wanting a top-quality media player won’t go too far wrong with the HiMedia Q5 Pro. Requires HiMedia Wrapper to be used in Kodi to access some features which can be unintuitive for some. 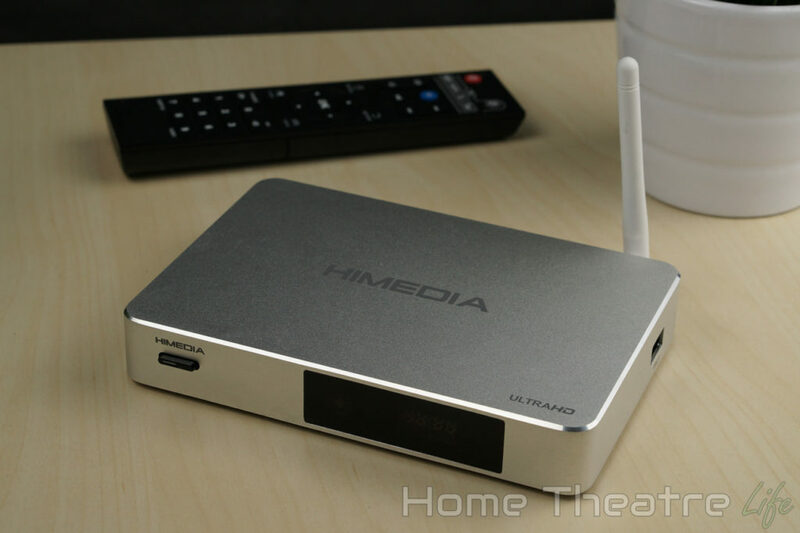 The HiMedia Q5 Pro is available from Amazon, Aliexpress, W2Comp and eBay.